This section presents free classified ads for Other vehicles for sale and to buy in Galway. FREEADS in Ireland is a platform to post efficient advertisements or classifieds in Galway. We help you find, buy, sell, rent or hire apartments, various goods for sale, local services offerings, cars, jobs and many more in Galway. If you are not happy with ads you see on this page please use search box above to find other items for sale in category Other vehicles and location Galway or select another category. 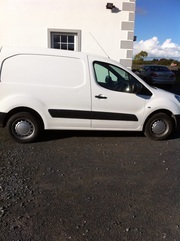 Peugeot Partner Van 2012 1.6 Diesel 60, 000 miles , full service history , mint condition one year DOE. fiat doblo 2009 full years doe tax till may roof rack and toe bar plylined very good van just been fully serviced €2650ono. Excellent condition 4 wheel scooter Front and rear lighting & indicators Swivel seat Flip up arm rests Weight capasity 159kg 2 speeds New rechargeable batteries fitted Rarely used Contact after 4pm. TAXI PLATE FOR SALE, METER, PRINTER & ROOF SIGN €2000. 0857791163 Galway City. blue 150cc buggy only have it 3 months payed 1300 2nd owner bought from dealer working good serious fun carb needs tweaking reason for sale getting into motocross would like quick sale no time wasters text me 0877547604 (calls after 4). Ireland free ads for Other vehicles, Galway, Other vehicles free ads Galway, Other vehicles for sale Galway, Other vehicles to buy in Galway. This page is a classified ads listing for Other vehicles Galway. This listing includes classifieds for sale and to buy in Galway. If you posted an advertisement on Other vehicles, Galway before please use Edit my ads button to change or cancel your ad. Other vehicles Galway ads Galway, Other vehicles classifieds Galway, Other vehicles free ads Galway, ads for sale Galway, ads to buy Galway, FREEADS in Ireland. Find here ads for sale, to buy and rent in Galway. Goods for sale in Galway, vehicles for sale in Galway, Galway real estate for sale, Galway property for sale, property for rent in Galway, business ads in Galway, Galway business classifieds, services in Galway, Galway services ads, jobs in Galway, pets for sale in Galway, Galway dating, Galway cars for sale.